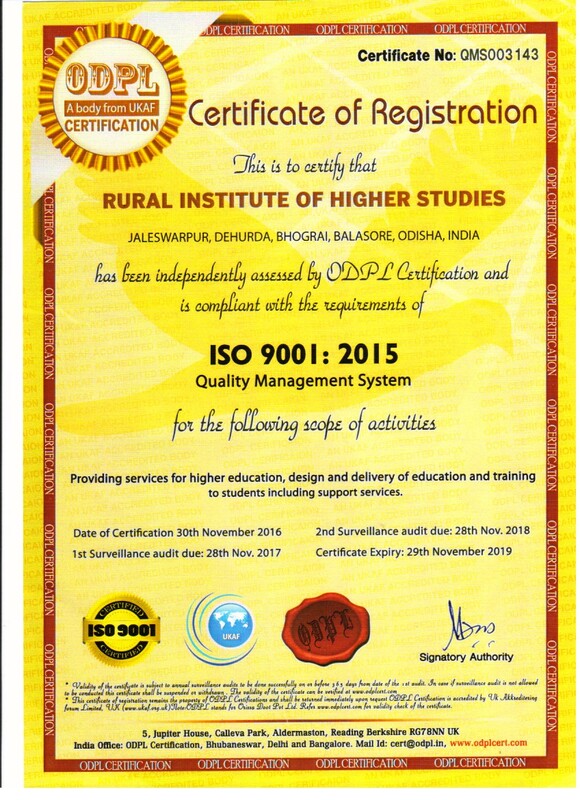 Rural Institute of Higher Studies justifies its title as a torch bearer for the rural folks of Bhograi, to provide them the light of wisdom & knowledge. This fertile land has produced fertile brain and intellect, but paradoxically having no alma mater of higher studies for a long time at initial stage (1980). The college starts functioning in the local defunct elementary training school with an initial capacity of 128 students. In 1981 the sanctioned strength in I. A. was extended up to 256 in +2 Arts & 128 in + 2 Science stream which got affiliation from the Higher Secondary Board in 1983. In 1986 +3 Degree course in Arts was introduced with an initial capacity of 96 students and it was again increased to 256 in 1994-95. In 1989, +3 Degree course in Science started functioning with 80 seats (PCM-48 & CBZ-32) along with +2 Commerce with 64 seats. Subsequently the Govt. of Odisha, Dept. of Higher Education was pleased to increase 64 seats in +2 Science and 32 seats in +2 Commerce from 2004-05. Again, it was pleased to increase 48 seats in +3 Science from 2007-08 and to open the new stream of +3 Commerce with 64 seats from 2006-07. The above seats of different streams of +2 and +3 are affiliated to C.H.S.E. and F.M.U. Odisha respectively. The 2nd of January, 1994 is a red lettered day in the annals of the college that started functioning in 1980 in a long abandoned and dilapidated building of an elementary training school shifted to a sprawling mansion by the untiring effort of the then Principal Prof. H. K. Das, thus making a permanent solution of space crunch to accommodate a body of students 2350 strong. Since then the institution has never looked back. The College now claims the achievement of having a spacious Campus with a strength of nearly 4000 students. The library is the most attractive section of the college having more than 23,676 books and journals sponsored under UGC scheme and college funding. The college has three Ladieshostels having the accommodation capacity of 30, 38 and 50 respectively. The college is having a newly built Administration Block and an Auditorium. The beautification of the campus and the introduction of ICT in every aspect has become the vision of the college in near future. Teaching facilities in this college are available in various honours subjects Like History, Political Science, Education, Sanskrit, Odia, Mathematics, English, Economics and Philosophy in the Arts stream and Chemistry, Mathematics, Physics, Zoology and Botany in the +3 Science stream and Accounting, Marketing in +3 Commerce Stream. At present the sanctioned seats in +3 Arts, Science, Commerce is 320, 224, 80 and in +2 Arts, Science, and Commerce is 384, 256 and 128 respectively. The dedication of staff has contributed the college to maintain an excellent academic track record for years that has resulted in producing several toppers both in council and University level. Since the inception of this institution within thirty Five Years of its lifespan can boast of one thing “Hardly has there been a single village in Bhograi at present where a graduate of this college is not roaming. Last but not the least, this institute has already passed its three glorious decades leaving a spectacular imprint in the field of wisdom and learning having its infrastructure, well equipped laboratories, vast library and hostels. 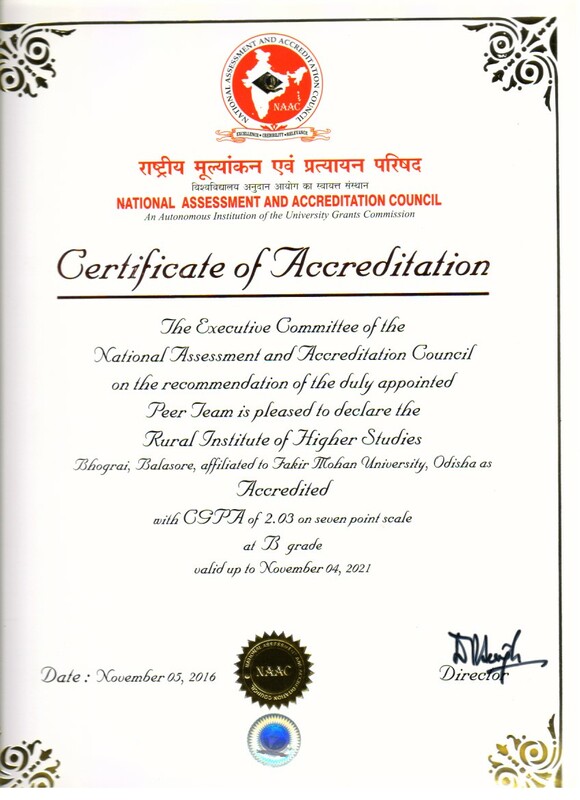 A special mention may be made here that the college has been accredited by NAAC in theyear 2016 and awarded with ‘B’ Grade.